It is a great art to laugh at your own misfortune. Check out our Crystal Ball Oracle. You have tried the others, now try this one out. We would love to know what you think of it. Just click here, to tell us. Ready to try the Oracle? Just click on the Crystal Ball to take you there! When will I be married? Does he/she love me? Will I win the lottery? You can ask the oracles questions of life, romance, or just about anything you can think of. Get your Horoscope, I Ching , Runes, Tarot Card, Numerology Readings and More... and all for FREE!! Want to know the best days to plant a garden, to get married, to cut your hair? Check out the Electric Alamanac. There are dates auspicious for almost anything! Click here, to visit the free fortune telling oracles! For entertainment purposes only. Note: Clicking on the oracles will open a new window. Just close the window when you are done to return to Grandpa's. Tired of the same old boring horoscopes and one-size-fits-all fortunetelling games? The first step toward learning your fortune is to pick your path from the choices available. Your answer will take you to another series of choices until you reach a relevant quote from History, Literature, Philosophy or Science. At that point, you will be asked to respond to the quote. How you answer determines your fate. Click here, to visit Inteligent Magic! For entertainment purposes only. Note: Clicking on the free stuff listing will open a new window. Just close the window when you are done to return to Grandpa's. animal rulers, and what animal was ruling the Chinese calendar the year you were born, Click Here to use our Chinese zodiac calculator! 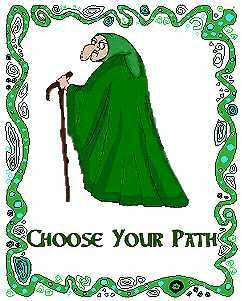 CELTIC ASTROLOGY ~ What Celtic Tree Did You Fall From? Are you an Ash, Walnut, Birch, or Weeping Willow? Ok, this is pretty cool, AND there is a listing of the REAL Celtic tree calendar on the page, as well. Why not try the first part, then check out the real Celtic astrology tree list. Maybe, when you are done, even visit the message board, to leave your opinion, and read the opinions of others! Click Here, to find out what tree you fell from!